The morning after its Canadian Gala Premieres, TIFF held the Press Conference for Damien Chazelle’s First Man. 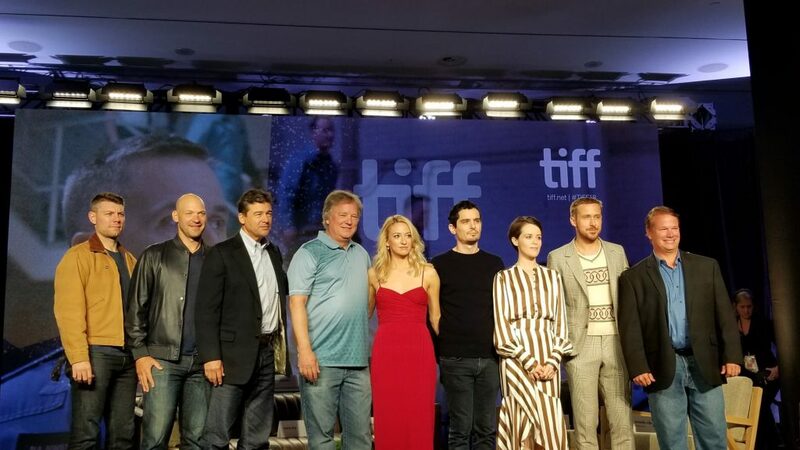 In attendance were Chazelle, Stars Ryan Gosling, Claire Foy, Kyle Chandler, Corey Stoll, Patrick Fugit and Olivia Hamilton, along with Astronaut Neil Armstrong’s sons Rick and Mark Armstrong. The Film chronicles the true story of Armstrong and his journey towards becoming the first man to walk on the moon. First Man screens on Sunday, September 9 at 2:00PM at Ontario Place Cinesphere, Monday, September 10 at 4:00PM at Elgin Theatre and 6:00PM at Roy Thomson Hall, Tuesday, September 11 at 11:00AM at Princess of Wales Theatre, Saturday, September 15 at 9:30PM at Princess of Wales Theatre and each day from Wednesday, September 12 to Sunday, September 16 at 6:00PM at Scotiabank Theatre.